Although we know precious little of what’s in store for Apple’s next tablet offering, that hasn’t stopped various rumors and speculation circulating around the Web. Some – in fact, many – were left disappointed by the iPad 2’s rather negligible set of updates. Sure, it had a dual-core processor, but both added cameras were pretty poor; just as well, since the Retina Display we’d become accustomed to with the iPhone 4 was mysteriously absent. For a while, it seemed as though Apple would be making up for it with the third addition to its tablet roster. Rumors had been prevalent for a large portion of 2011, dating back as far as May, with one Hollywood insider at the time stating the likelihood of a 3D iPad 3 as a "dead-cert". A mere month later, a prototype iPad was spotted in Taiwan sporting a 3D display, seemingly adding credibility to the rumors. BusinessInsider, citing a reliable source, notes that Apple has indeed toyed with 3D screens. "The iPad 3 was often called iPad 3D in early prototypes," so said the source. Apparently though, Apple decided not to go ahead with a 3D screen since, again quoting the source, "they didn’t want it to be a gimmick." The tipster also gave a little more insight to the type of 3D screen Apple toyed with, noting that it would have been similar to the Nintendo 3DS in that users would not have been required to sport those notably un-cool 3D glasses. Despite the prospect of an iPad 3D seeming dead in the water, that isn’t to say the fruit company has ditched the idea altogether – despite fearing the gimmicky label. In fact, the tipster hinted that 3D will likely make a return at some point – but only when it is "useful". Disney is supposedly 3D-fying its expansive catalogue ready for that day – if and when it does arrive. Apple isn’t renowned for being an early adopter of new technologies (see 4G / LTE), preferring to let rivals discover and iron out the limitations. We shouldn’t read to much into the fact that the Cupertino recently filed a patent for a 3D screen just a couple of months ago, either, since it has done this on many occasions for products which have never reached fruition. 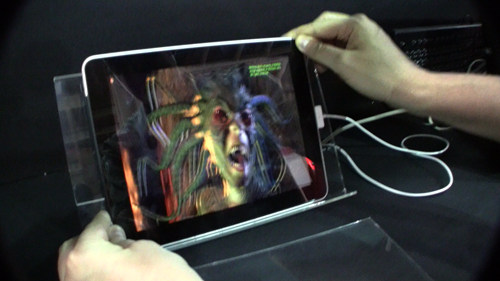 3D iPad in future – gimmick, or game-changer? Discuss!